As a child, I loved to watch my mom style herself for a party. She would spread her selections on the bed and try on one or another. This would last about an hour or so- at least now I know who I inherited this awesome feature from. Finally, dressed up she would open her jewelry box and begin to meticulously place her finishing touches on the ensemble before thoroughly examining her reflection in the mirror. After many years of observing this ritual on a daily basis, I came to realize that “it’s not what you wear, but how you wear it.” Sometimes simplicity would be a factor in her wears; other times heavy layering or statement pieces were the main focus. Responding to my “Why do you take so long to get ready?” she would smirk and say: “You’ll see when you grow up.” She was absolutely right; I do understand now how important those details are. This Spring’s, jewelry is what’s trending! Spring 2014 brings us a fun array of trends and styles that will be the talk about town. We come into this new year with a different perspective on designer styles and begin to see a more deconstructed allure in high fashion. It’s time to get acquainted the best looks for you. Since the runways showcased so much neck adornment, I decided to shed new light on the use of necklaces. I’ll give you tips to choosing the most appealing pieces for your own collection. Christian Dior presents us with a soft palette of color this season. Gold chains in avery thick and bold design are what you need to start looking for. Heavy attention to chunky links around the neck and waist will beautify any outfit that you wear.;. Be it an elegant dress paired with a pair of gorgeous pumps or a rock shirt matched with a leather skirt and studded booties, the gold chain will add the right touch of “glam” to any look. Plus, it’s easy to find matching jewelry pieces to complement this item. Forget about wearing just one single necklace. Layering is trendy not only with your clothing pieces, but also with accessories. Long link chains with beads and stones mixed together definitely have a bohemian zest. It doesn’t matter what stones are featured: multicolored beads or sparkling gemstones add a lot of shine to the look. You can pair such a necklace with a very plain tank top or a collared shirt. Depending on which look you are trying to create, there are a huge number of variations to choose from. 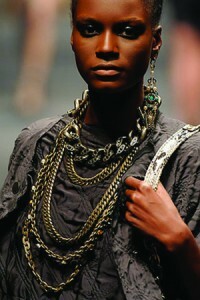 Keep in mind that a conservative look can be spiced up with a nice long link necklace or cool beads. Paired with these beautiful neck adornments, the usage of bead and linked bracelets remains popular as does heavy layering when the neck is more simplistically styled. Don’t shy away from layering on the arm candy — the usage of wrapped neck pieces as wrist adornments brings versatility and individuality to your look. Mixing up the media is a sure way of creating a fun look that will inspire more adventurous outings. When it comes to dressing up your digits, it’s also about layering. From the tips of your nails to multiple-finger rings, we see a broad spectrum of hand decoration. 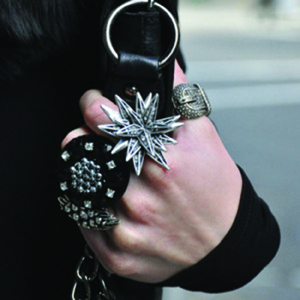 Rings linked to bracelets or individual knuckle rings, chunky cocktail rings with stones or simplistic metal shanks — the options are endless. 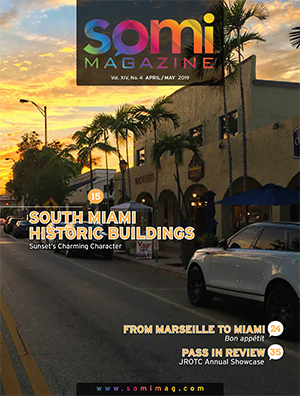 Even amidst layers brought on by a polar vortex, Miami still holds its tropical whimsy. Layering up isn’t something we just do to keep warm. It’s about making a statement.. So while you create your spring outfits, keep a refined eye when styling, and indulge in the wonder of jewels from head to toe!